Keeping our eyes open for branding opportunities. 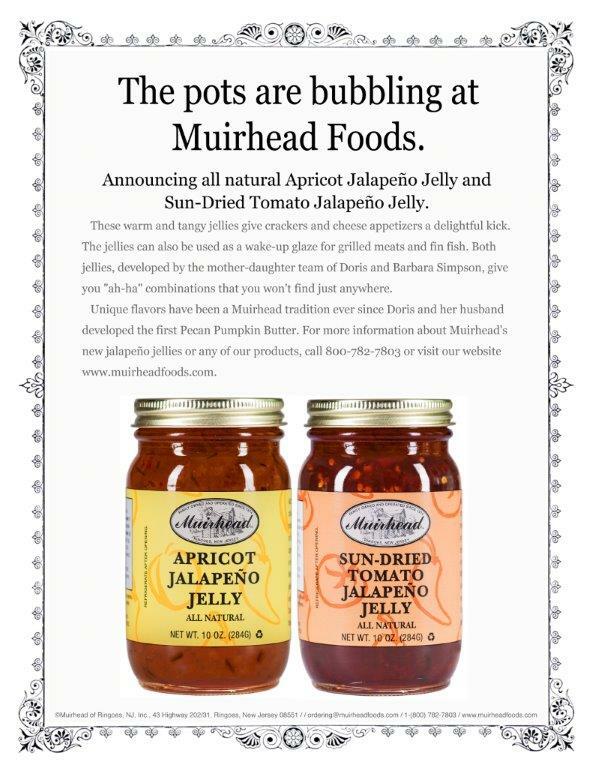 Our client, Muirhead Foods asked us to develop a sales sheet that listed all their 29 finishing touches for your meals. Now, the Muirhead women make products that taste homemade, like salad dressings without the gums you’ll find in most commercial salad dressings. And they create step-ahead flavor combinations, like their sophisticated pear and port butter. So we decided to make our first sales sheet more their story, than a product list. You know, strengthen their brand. 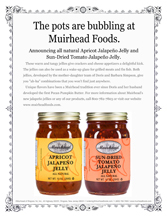 That worked so well that Barbara asked us to do another sales sheet to introduce their new apricot jalapeno jelly and sun-dried tomato jalapeno jelly. They’re typical Muirhead-women-with-fresh- ideas products. So the sales sheet headline mixes hominess with avant garde flavors and the old fashioned jars wear our contemporary labels.